OK, so I finished knitting the Manly Boy Jacket ages ago. Why are there no photos? Well, I procrastinated on piecing everything together when I got frustrated with the sizing :p Instead of a size 1 or 2, I reckon this thing looks like it’s for a 3yr-old! Only up side to this is that I, very conveniently, have a 3.5yr-old darling nephew, so I might give it to him (if it fits) and make another one for bubs. Another reason I’ve taken so long to finish it off is because I’m packing to move. We moved from Melbourne to Geelong (1.5hours drive) in January 2010 because hubby had to work at the hospital there for a year. We knew it was only for a year, so we were always only half unpacked…but when I received my little bundle (a.k.a a certain cute bub), along with him came all his gear and furniture, so we’re back to lots and lots of packing now, getting ready to move at the end of the month. 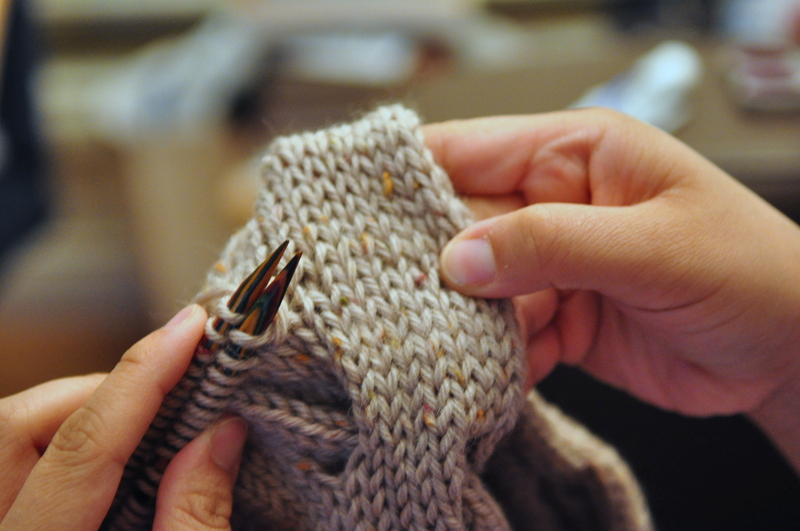 So, what better way to tackle the big move than ermm…knit? 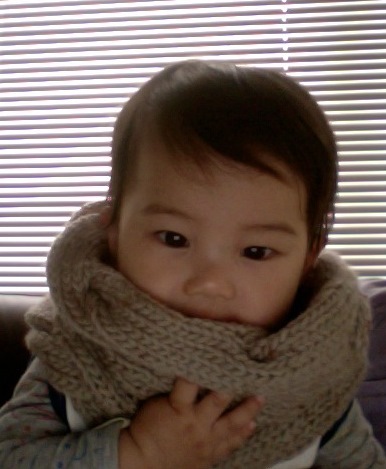 The pattern is called “Tuesday Cowl”. It is provisionally cast-on (I use the crochet method, tutorial here) and grafted (Kitchener Stitch) once you’ve finished knitting so the seam is invisible. By strategically placing cables, the cowl “scrunches” down quite nicely. 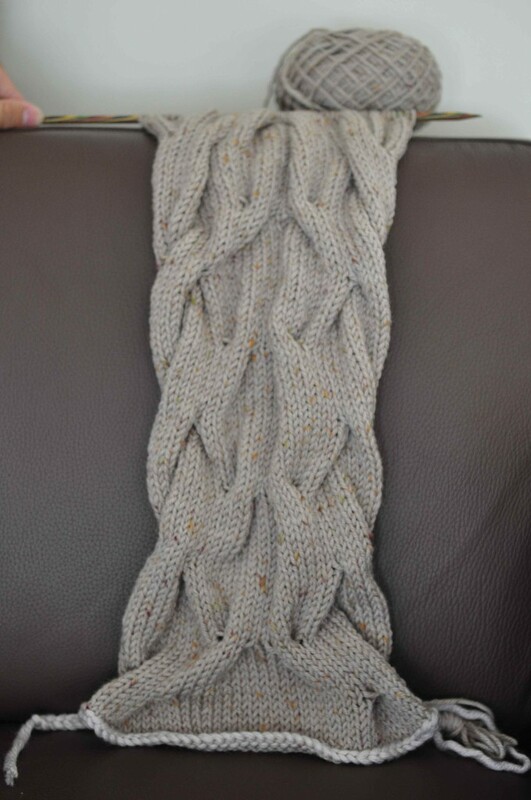 All knitted up, ready for grafting! Even though I measured the length of the cowl before grafting, I wasn’t sure how tight-fitting it would be around my neck. If I made this again, I’d add an extra repeat of the cables. He looks better in it than I do! This is so warm and comfy to wear! Bendigo Woollen Mills Rustic yarn turned out to be quite nice to knit with. 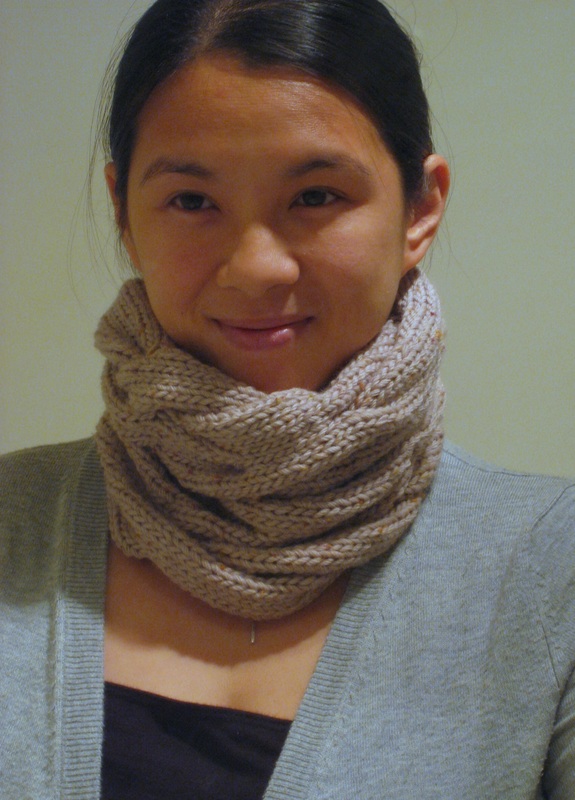 This entry was posted in Knitting and tagged Cowl, Neckwarmer. Bookmark the permalink.